The idea to buy when the market is down is contrary to the idea that you should wait to invest until the market is “going up.” It is also contrary to human nature that often wants to pull out of markets that have just gone down and move into markets that have just gone up. “Buying on the dips” assumes that there is fair value around which the market price is oscillating. It assumes that when the price dips too low there will be a reversion to the mean. This reversion, it is assumed, will cause the price to rise faster after a dip in price. Day traders who watch a stock’s gyrations look for a channel of valuations that the stock is moving within. Then, they try to buy the stock when it is at the bottom of the channel and sell the stock when it is toward the top of the channel. They argue that they can make money even when the stock price doesn’t on average rise. The opposite approach would argue that stocks have their own momentum. And a stock, once in motion, will stay in motion. This view assumes that a dropping stock will continue to drop and a rising stock will continue to rise. 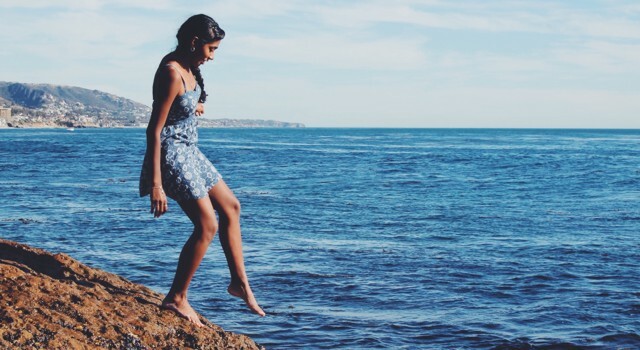 These philosophies are important because the sentiment behind them can cause average investors to either wait for a market dip or for a market rise before investing. Both approaches leave investors waiting to invest and waiting to invest on average loses money to always immediately investing. I’ve shown in previous articles that the return of the past 12 months is irrelevant to the return of the next month or the next year. It is difficult to evaluate an investment strategy that is vague. As soon as I make it concrete enough to analyze, there will be investors who will suggest that I am not “doing it right” and, if I only used their complex judgement, I would see the value in the approach. “Buy on the dips” is extremely vague. It does not state how large of a dip to look for or over how long of a time period should trigger the buy. Nor does it specify from where the money we are using to purchase stocks is going to come. Some suggest that the technique only works for individual stocks under certain conditions and not the market as a whole. Others suggest it does work for the market as a whole, but that the time period of a dip is as short as the previous week and the benefit shows up during the next week. 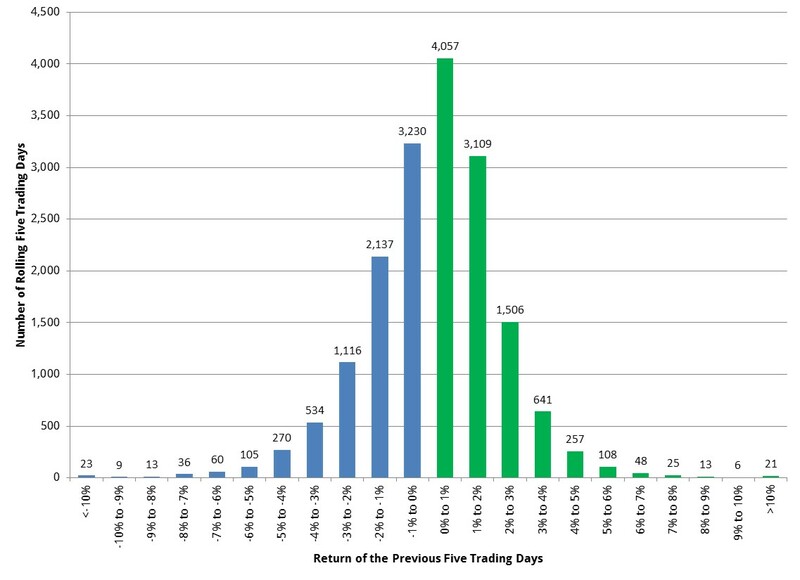 So I did a study of how the return of the previous 5 trading days (my definition of a week) correlated to the return of the subsequent trading days. The first step of the analysis was to group the previous 5 trading days by 1% movements. Over 98% of the rolling five day returns fall between -6% and 6%. In this frequency graph, you can see that, on average, the stock market rises just a little bit (between 0% and 1%) each rolling five days. The average weekly rise is about 0.17%. With all the rolling 5 trading days grouped, I can then compare those 5 days to the 5 days of the next week. The extremes of this graph (toward the left and right sides of the graph) have some wild average returns the week after there were wild returns. This is partly because they are represented by a very small number of rolling 5 day returns. Less than 2% of the rolling weeks fall outside of the -6% to 6% range of returns. 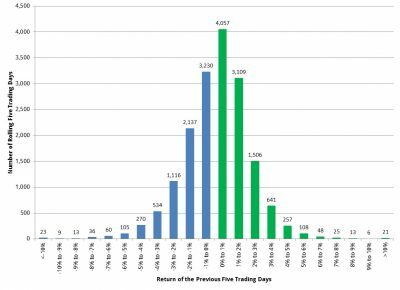 For example, the -10% to -9% return of the previous five trading days is represented by just 9 periods out of a total of 17,368. Similarly the entire set of weeks with a return over 7% are represented by just 0.0037% of the total returns. Perhaps the best that might be said is that when the markets have been volatile for the previous 5 days they are liable to be volatile again, but on average that movement will still be positive. There are some correlations. 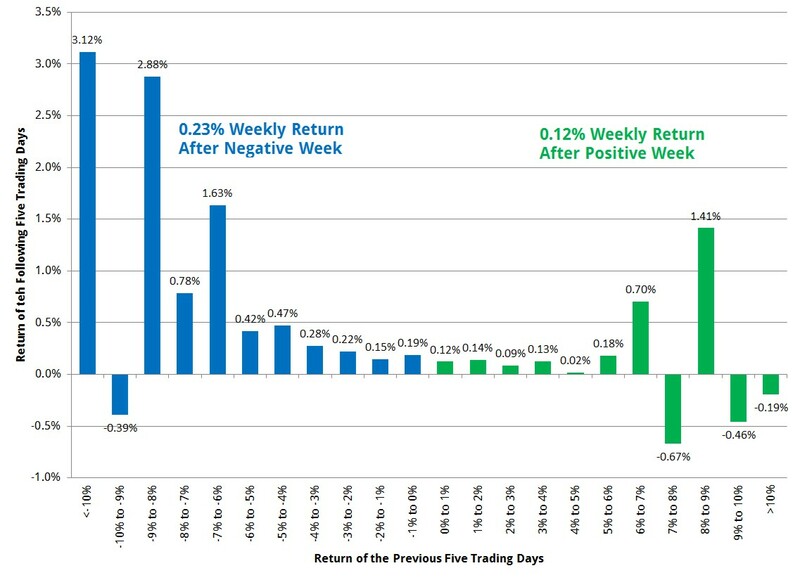 After a week with a negative return, there is, on average, a 0.23% positive return the following week. Meanwhile after a week with a positive return the subsequent week has, on average, only a 0.12% positive return. To be clear, this means you should invest in the markets as soon as possible. Every week you delay investing after a negative week in the markets you lose, on average, the missed opportunity of a 0.23% return. Meanwhile every week you delay investing after a positive week because you are waiting for a dip before you buy, you lose, on average, the missed opportunity of a 0.12% return. Thus, this study suggests that there is no benefit to delaying your investing. On average, investing is always better than not investing. Investors who sit and wait eight weeks for a dip in the markets before investing lose, on average, a full 1% of missed opportunity in the markets. And those who are waiting because there was a dip in the markets on average lose even more. Don’t wait for a dip before you invest. Definitely don’t wait for the markets to go up before you invest. Just invest now. I looked at many of the buy-on-dip advocates. Their argument was basically after a significant drop, stock prices look more attractive and have a higher expected mean return. And yes, that appears to be true. When the price randomly drops, the price per earnings makes the investment look more favorable. But this is an argument for rebalancing, not waiting for dips to invest. On average, rebalancing sells what has just gone up and buys what has gone down. Coupled with the expected averages, what you are selling (because it has gone up) might have a 0.11% lower expected return over the next week than what you are buying (because it has gone down). The formula to compute the benefit from this rebalancing would depend on a complex formula of what percent of your investments is being moved, how frequently the two investments have moved in different directions, how frequently the two are rebalanced, and how large the volatility of their movements. I set up a very modest sample of two investments which moved in sync with one another 80% of the time (a correlation of 0.8). Most weeks they appreciated exactly the average 0.17%. Two weeks out of ten they vary by plus or minus 2% alternating which investment did better and the following week the down investment appreciates by 0.23% and the up investment by only 0.12%. The mix that rebalanced weekly out performed the mix that did not rebalance by 0.22% annually. And the greater the variance between the two investments the greater the rebalancing bonus. With a 2% alternating variance, the rebalancing bonus was 0.22%, but a 3% variance produced a 0.49% bonus, and a 4% variance produced a 0.87% bonus. In other words, the more volatility in the investment categories you select for your investment sectors, the greater the rebalancing bonus. The rebalancing bonus also increases inversely proportionate to the correlation. A correlation of 0.6 where the two investments moved out of sync 40% of the time roughly doubled the benefit of each variance with rebalancing bonuses of 0.44% for a 2% variance, 0.98% for a 3% variance, and 1.74% for a 4% variance. When in doubt, the right answer is nearly always “Rebalance.” If you have money that should be invested in the markets, invest it as soon as possible. Money invested in the markets, on average, makes more money than if it were not invested. It is a good time to invest even when the markets are up. When the markets are down, it is a great time to invest. We believe it is always a good time to have a balanced portfolio. You should not hesitate to buy because the market has dipped any more than you should hesitate to invest when the market is making new highs. The market makes a new high about 18 trading days every year, but on average the market continues to go higher anyway.